Choosing the right sled for your pulk can be more of an art than a science. The proper choice depends on what you are hauling and what kinds of trail you will be using. 1. The depth of the sled is important to keep the sled floating above the snow. While 5-7 inches is essential, substantially more than that is only important if you plan to haul a lot of loose stuff, or will be navigating through rough terrain with lots of obstructions like polar ice blocks. 2. Width is another critical issue if you expect to be traveling on any fresh snow. The wider the sled the more snow you have to plow. This may not be an issue on a packed snowmobile trail, but it is critical in fresh snow. Most people like sleds between 14 to 22 inches wide. Narrower sleds/toboggans ride better in a snow shoe “float” or trail. Wider sleds plow more snow but are more stable in resisting rollover. 3. Length is important in determining maneuverability. The shorter the sled the more maneuverable it will be, but trying to carry the same amount of gear from a long sled on a shorter one will require packing the load higher and will result in less stability and more frequent rollovers. Rollovers are one of the most discouraging aspects of traveling by pulk. 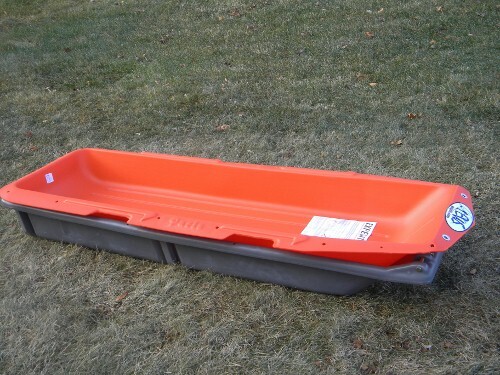 If your sled is rolling over a lot- get a longer sled or leave some stuff at home. 4. All sleds utilize some form of runners on the bottom to help the sled track straight. These also give the sled bottom rigidity. Adding skegs, fins or long shaped ridges on the bottom of the sled will reduce side hill slip and sleds swinging into a fish tail on a downhill. From the negative perspective they will add friction in some snow conditions. 5. The most important characteristic of a sled in deep snow is the shape of the front or leading edge of the bow. Using the analogy of a ship – you are looking for a shape like an icebreaker hull that rides up on the ice rather than the shape of a tanker that slices through the water. 6. Besides determining durability, the sled material is important in both determining how well it will glide (low coefficient of friction) and in how likely it is to ice up in variable snow conditions. The icing problem and weight has resulted in very few modern metal pulks. Fiberglass or other composite shells offer the greatest strength to weight but they are easily damaged by rocks. Due to the strength and cost of composite sleds, you usually find this material in larger expedition style pulks. Most sleds for short to mid-sized pulks use some form of high density polyethylene. 7. Common molding processes are thermo-formed from flat sheets, injection molded from liquid plastic or rotationally molded from plastic pellets. 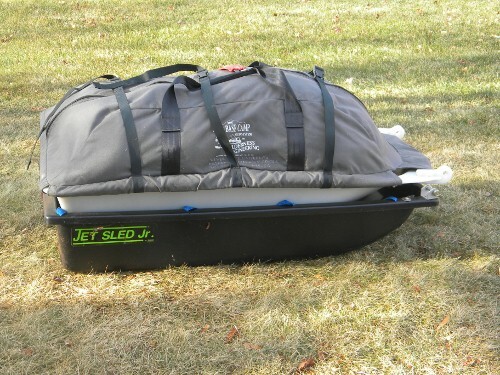 The sleds that are durable enough for pulks usually have about 1/8” of thickness or more. Our experience with injection molded sleds are that they have excellent glide and rigidity but are a little more brittle in cold temps. Thermoformed sleds glide well and do not seem as brittle but they are thinner on the bottom of the sled where the greatest wear is. Rotationally molded sleds glide well, are not brittle, have no thin spots but often are slightly heavier than the others. Rigidity is important in protecting your load and maintaining the proper shape to float above the snow and track well. While some of the rigidity is inherent in the sled material, much of the rigidity comes from the sled’s features and rims. Some sleds gain rigidity from wide flat rims and others use rounded narrow rims. Sometimes the wide rims give the impression of a bigger sled. Take, for example, this view of the 59x19x6 inch Paris sitting in the smaller shell of the 56x18x7 inch Snowclipper. In another example, most casual observers would suggest that the Wilderness Engineering sled is significantly bigger than the Jet Jr. but this view demonstrates that looks can be deceiving. The end result is that there is no one best sled. Make your decision based on what aspects are most important to you.